PORTLAND, Ore. — Oregon’s unique Citizens’ Initiative Review Commission has sent a special mailing to 10,000 randomly selected registered voters in Oregon with an invitation to serve as a citizen panelist for the next Citizens’ Initiative Review. From this list, 24 Oregon citizens will be empanelled to participate in the review. The Citizens’ Initiative Review, passed into law in Oregon in 2011, brings together a broad cross-section of Oregon voters to learn about the details of a high-impact ballot measure to be voted on in November and to evaluate the pros and cons of the initiative. Those voters who participate in the review are randomly selected to match the demographics of the state in areas such as congressional district, political affiliation, age, race and ethnicity, gender, and educational background. 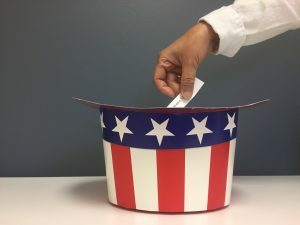 For each ballot initiative review, the panelists spend four days hearing from subject matter experts as well as proponents and opponents of the ballot measure. They also have the opportunity to ask questions and deliberate amongst themselves about what they feel is relevant, reliable and unbiased information about the ballot measure in question. Citizens who receive the mailing from the CIR Commission are encouraged to respond by email to the link provided, or by mail. 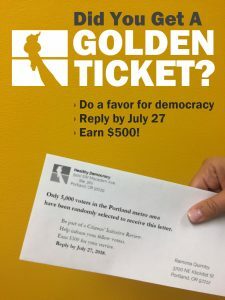 According to one former panelist, receiving the invitation from the Commission to participate “was like winning the democracy lottery” since just 24 people will be selected from the 10,000 initially contacted to serve on behalf of their fellow voters. The ballot initiative to be reviewed will be selected by the CIR Commission next month. Ernie Estes, a former CIR panelist and newly elected CIR Commission Chair, will help oversee the process of determining which initiative will be reviewed by the citizen panel. “Everyday Oregonians will come together, thoughtfully consider these issues and help cut through the advertisements and sound bytes to deliver fact-based information to their fellow voters,” he said. At the conclusion of the review, the panel will produce a Citizens’ Statement to give voters key facts about the measure and arguments for and against its passage. This year’s review will take place from August 18 to 21 at Western Oregon University in Monmouth. Results will be announced at 5:30 pm on the last day of each review, and members of the public and media are invited to observe at any time. For more information, visit the CIR Commission website at http://www.oregon.gov/circ or Healthy Democracy’s website at healthydemocracy.org.